Therefore, Lotta and Mary Ann befriended a group of entertainers, who gave them a temporary home, and Mary Ann enrolled Lotta in dance classes. After finally joining John at Grass Valley, the Crabtrees ran a boarding house for the miners. Tiny, red-haired, six-year-old Lotta danced and sang for the local miners, while they showered her with gold nuggets and coins. Lotta attracted the attention of a neighbor, dancer and actress Lola Montez, who encouraged her enthusiasm for performing. The story has been told that Montez wanted to take Lotta with her on a tour of Australia, but Mary Ann would not allow it. This attention by such a celebrated personality, however, confirmed Mary Ann’s opinion that Lotta had talent, and she signed her up for more lessons. The Crabtrees moved again and set up another boarding house, this time in Rabbit Creek, forty miles north of Grass Valley. Soon after, Lotta made her first professional appearance at a tavern, and began touring throughout the California and Nevada Gold country, making a name for herself by dancing, singing and playing the banjo. Mary Ann served as Lotta’s manager, and swept the stage after every performance, looking for any bits of gold she might have missed. She was not only the quintessential stage mother but also a shrewd businesswoman. According to legend, when the large leather satchel containing Lotta’s earnings in gold got too heavy, Mary Ann would buy real estate in the towns where they toured. touring the Sacramento and San Joaquin Valleys. The theaters in San Francisco brought Lotta to a real stage for the first time and started her on the road to fame. She occasionally experienced ‘stage fright’ but with a little coaxing from Mary Ann, once on stage she became a professional. By 1859, she had become Miss Lotta, the San Francisco Favorite. In April 1864, sixteen-year-old Lotta performed a farewell show in San Francisco and the Crabtrees sailed back to New York City, where she began acting in such plays as Uncle Tom’s Cabin and Little Nell and the Marchioness, which was adapted for her by John Brougham from Charles Dickens’ The Old Curiosity Shop. With her petite size, she became famous for her portrayals of children. By age 20 she was a national star. She took to smoking thin black cigars, which although not a very lady-like thing to do in those days, would become her trademark. For the next 20 years, Lotta was highly popular on the American stage. 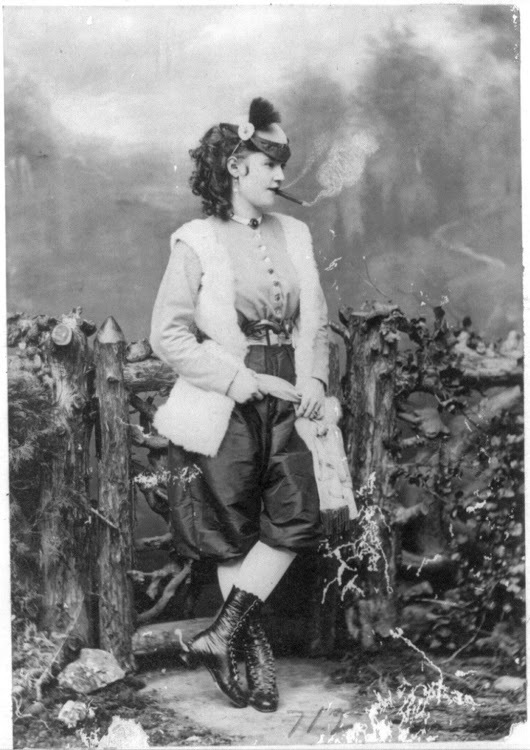 By 1875, she was touring with her own theatrical company, rather than using local stock companies, and she achieved the height of her success in the 1870s and 1880s. The New York Times called her the eternal child and throughout the 1870s and 1880s she was called the nation’s darling and the belle of Broadway. Lotta had many admirers, but she never married. Some said her mother would not allow it as it would end her ability to be considered forever young, and her career left little time for a social life. Lotta’s act remained remarkably consistent throughout the years. She sang up-tempo tunes and ballads, danced energetically and made slightly naughty remarks. By the 1880s Lotta Crabtree was the highest paid actress in America, earning sums of up to $5,000 per week. Mary Ann was still managing Lotta’s affairs: booking plays, finding locations and organizing troupes of actors. She also invested Lotta’s earnings wisely, as well as supporting local charities. While traveling abroad with Mary Ann and her brothers, Lotta learned to speak French, visited museums and took up the hobby of painting which she pursued for the rest of her life. Lotta then returned to San Francisco where she reprised her role in Little Nell and the Marchioness. The city responded warmly to her return. 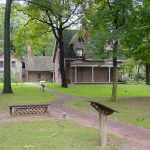 In 1885, Mary Ann purchased a choice parcel at a resort on the shores of Lake Hopatcong, New Jersey and had noted architect Frank Furness design a summer cottage as a gift for Lotta. Not a typical cottage, this was an eighteen-room mansion with a wine cellar, billiard room, music room, library, beautiful fireplaces and sweeping verandas, which she named Attol Tryst (Attol is Lotta spelled backwards). Lotta used the place to rest and entertain in the summers when most theaters were closed. Lotta Crabtree suffered injuries in a bad fall at Wilmington, Delaware in May 1889. After recovering, she attempted a comeback in 1891, but then retired permanently from the stage in 1892 at the age of 45. At that time she was America’s wealthiest actress. She and her mother retreated to the summer cottage on Lake Hopatcong, where Lotta was the most famous resident for many years. Lotta traveled, painted and was active in charitable work. However, her trademark cigars prevented her from becoming a member of the prominent ladies social group, Sorosis, much to her mother’s disappointment. Lotta would only laugh, and shake the skirts that society matrons thought were scandalously short. As Mary Ann’s health declined, they spent less and less time at the lake; after her death in 1905, Lotta sold the lake house and became more reclusive. In the ensuing years, Lotta still maintained a relationship with her friends at the lake, last visiting in the fall of 1922. She made one final public appearance in 1915 for Lotta Crabtree Day in San Francisco at the Panama-Pacific Exposition, where the city turned out to remember their beloved Lotta. 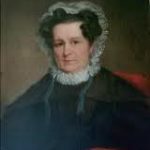 She then purchased the Brewster Hotel in Boston, where she lived alone but regularly traveled to Gloucester to paint seascapes, with a cigar in her teeth. 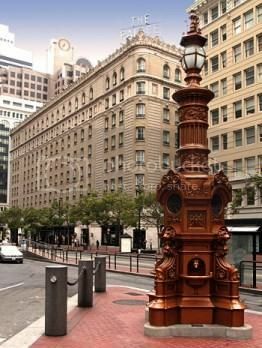 Modeled after a lighthouse prop from one of her plays, this was her gift of appreciation to the people of San Francisco. 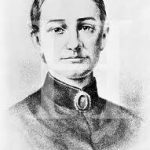 Late in her life, Lotta also owned some acreage in Quincy, immediately south of Boston, which was purchased for the benefit and health of her brother Ashworth and their horses. Lotta Crabtree died September 25, 1924 at the age of 76 and was interred next to her mother in Woodlawn Cemetery in the Bronx, New York. She left the bulk of her $4 million estate in a charitable trust for the care of veterans, aging actors and animals. She was also very interested in educational opportunities for women. Crabtree Hall, a dormitory at the University of Massachusetts Amherst, is named for her and there is a Lotta window at St. Stephen’s Church in Chicago. A large trust remains today to be used for humane and educational purposes.